The Pharmaceutical Research and Manufacturers of America (PhRMA) represents the country’s leading pharmaceutical research and biotechnology companies, which are devoted to inventing medicines that allow patients to live longer, healthier, and more productive lives. PhRMA companies are leading the way in the search for new cures. PhRMA members alone invested an estimated $43 billion in 2006 in discovering and developing new medicines. Industry-wide research and investment reached a record $55.2 billion in 2006. PhRMA is the public relations and lobbying arm of the pharmaceutical industry (Big Pharma). Most of the $55.2 billion in R& D quoted above is actually used to market and promote their drugs as the articles below will clarify. How the President and CEO of PhRMA, Billy Tauzin, got his post: Several lawmakers who worked on the bill [Medicare prescription drug bill, the most expensive bill in U.S. history] have since joined firms that lobby for the drug industry, including the man who steered the legislation through the House, former Rep. Billy Tauzin (R-La. ), who also chaired the House committee that regulated the pharmaceutical industry. Tauzin retired to become the president of PhRMA, the drug industry’s top lobbying group — a $2 million-a-year post. Even more damage is done by PhRMA via their bogus "grass roots groups" such as "Citizens for Better Medicare" and "Americans for Job Security". 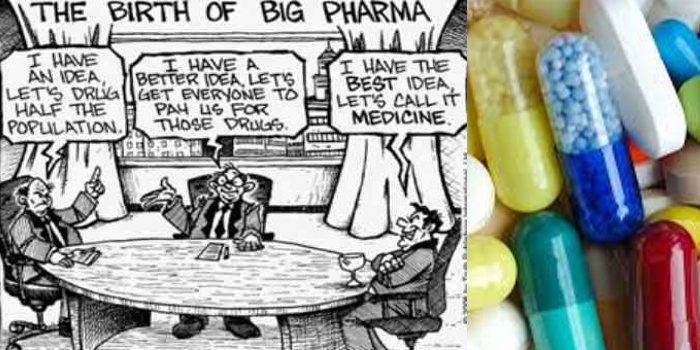 "There is no lobby in Washington as large, as powerful or as well financed as the pharmaceutical lobby, and according to a report from Public Citizen, more than half of the drug industry's 625 registered lobbyists [that is more than the number of members of Congress!] are either former members of Congress or former Congressional staff members and government employees ... Other evidence suggesting possible FDA bias turned up in a study revealing that 37 of the 49 top FDA officials who left the agency moved into high corporate positions with the company they had regulated. Over 100 FDA officials owned stock in the drug companies they were assigned to manage." "Drug companies do not look for 'cause.' The drug company business model is based on 'sustainability.' Rather than find a cause and cure, patients are simply sustained. There is not a single prescription drug that offers a 'cure' to any ailment. Curing a disease versus treating its symptoms does not make 'business sense' to drug companies. Just like government can only profit from criminals, the drug industry only makes money from sick people - sick people with insurance. An investigator with the Pennsylvania Office of the Inspector General was removed from his post and sent home after he talked to the press about his discovery of a black bank account fed by pharma companies Janssen and Pfizer and apparently used to pay off FDA officials in charge of approving drugs. The story is reported in the British Medical Journal. A whistleblower who uncovered evidence that major drug companies sought to influence government officials has been removed from his job and placed on administrative leave. Allen Jones, an investigator at the Pennsylvania Office of the Inspector General (OIG), was escorted out of his workplace on 28 April and told "not to appear on OIG property" after OIG officials accused him of talking to the press. Reports of Mr Jones's findings were widely reported in the New York Times, BMJ (7 February, p 306), and elsewhere. His findings showed that the pharmaceutical company Janssen had paid honorariums to key state officials who held influence over the drugs prescribed in state-run prisons and mental hospitals. Mr Jones filed a suit on 7 May against his supervisors charging that the OIG's policy of barring employees from talking to the media was "unconstitutional." Mr Jones claims, in the complaint filed in the Middle District Court of Pennsylvania, that he is being harassed by his superiors and Pennsylvania governmental institutions in order to "coverup, discourage, and limit any investigations or oversight into the corrupt practices of large drug companies and corrupt public officials who have acted with them." Mr Jones had been earlier removed as lead investigator on the case after being told by a manager that "drug companies write cheques to politicians on both sides of the aisle." In July 2002 Mr Jones was appointed lead investigator when he uncovered evidence of payments into an off-the-books account. The account, earmarked for "educational grants" was funded in large part by Pfizer and Janssen Pharmaceuticals. Payments were made from the account to state employees who developed formulary guidelines recommending expensive new drugs over older, cheaper drugs with proved track records. One of the recommended drugs was Janssen's antipsychotic medicine risperidone (Risperdal)—a drug that has recently been found to have potentially lethal side effects. The Food and Drug Administration issued a warning letter to Janssen on 27 April saying that Janssen's "Dear Healthcare Provider" letter about risperidone was "false or misleading" because it failed to disclose or minimised risks of the drug relating to "serious adverse events including ketoacidosis, hyperosmolar coma, and death." Don Bailey, Mr Jones's attorney, said the case is a critical test of the right to a free press. "If they shut the employee up and they have all the documents locked up in a drawer there is no free press," he said. Amy Wasserleben, spokeswoman for the OIG, said they would not comment on Mr Jones or the corruption allegations. When asked about the status of the corruption investigation she refused to answer. In response to a question about whether the state OIG could withhold information of public interest, she said, "The OIG is specifically exempt from right-to-know laws." The Pennsylvania formulary is based on the Texas Medication Algorithm Project that has been exported to about 12 states and was recently commended as a model programme by President Bush's New Freedom Commission. However, Dr Peter J Weiden, who was a member of the project's expert consensus panel, charges that the guidelines are based on "opinions, not data" and that bias due to funding sources undermines the credibility of the guidelines since "most of the guideline's authors have received support from the pharmaceutical industry. The pharmaceutical and health products industry has spent more than $800 million in federal lobbying and campaign donations at the federal and state levels in the past seven years, a Center for Public Integrity investigation has found. Its lobbying operation, on which it reports spending more than $675 million, is the biggest in the nation. No other industry has spent more money to sway public policy in that period. Its combined political outlays on lobbying and campaign contributions is topped only by the insurance industry.